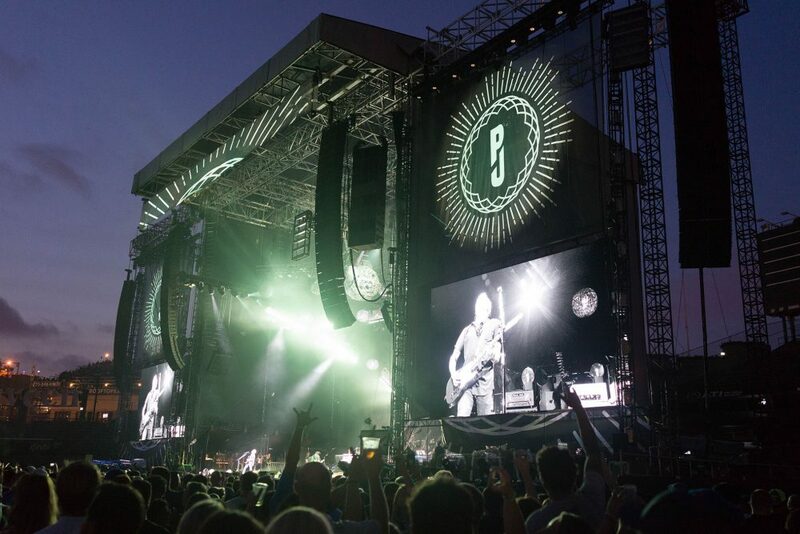 SEATTLE, WA – Rat Sound Systems provided a full complement of L-Acoustics loudspeaker systems for Pearl Jam’s two sold-out “Home Shows” to benefit King County homeless-related organizations and service providers. Playing three-hour shows with 30-plus songs and setlists that change with each performance, Pearl Jam is well known for giving audiences their money’s worth. But on the band’s most recent stadium run, there was another group that received an even more tangible financial benefit: Seattle’s homeless population. Following Pearl Jam’s two sold-out Safeco Field “Home Shows”—the band’s first hometown Emerald City concerts in five years—the band donated $868,189 from ticket and merch sales to a variety of King County homeless-related organizations and service providers. Furthermore, this outpouring of generosity helped prompt philanthropic donations from other organizations ultimately totaling $10.8 million, according to The Seattle Times. Pearl Jam’s pair of Seattle shows followed tour legs in South America and Europe this spring and summer, and served as the kickoff for a subsequent three-city, five-date tour of “Away Shows” in major sports venues: Washington-Grizzly Stadium at the University of Montana in Missoula, Wrigley Field in Chicago, and Boston’s Fenway Park. Rat Sound Systems, the band’s longtime touring reinforcement provider, carried a full complement of L-Acoustics loudspeaker systems for the sold-out shows. Rat Sound’s relationship with Pearl Jam goes back to the band’s debut album, Ten (1991), when it opened for one of Rat’s other longtime accounts, Red Hot Chili Peppers. Since then, the company has served as the group’s primary live production provider. Greg Nelson has been the man in the FOH mixing chair for Pearl Jam since 2004, when the band toured with its first V-DOSC system. In 2010, the band transitioned over to a K1 rig for the first time, which it has been using for tours ever since, including this recent run. The standard show setup for the US outdoor stadium shows featured left and right main arrays of 16 K1 with six K2 down-fills flanked by two identical outfill arrays. Low-end punch was delivered by dual hangs of eight KS28 subs in cardioid mode, flown adjacent to the two main arrays, and bolstered by 40 ground-stacked KS28 arranged in ten cardioid stacks of four. Front-fill was achieved by a combination of double- and triple-stacked Kara enclosures positioned atop ground-stacked subs, plus four ARCS II in a horizontal array under each main K1 hang. Stage sidefills were comprised of left and right hangs of four K2, while audience delays consisted of four arrays of 12 K2. For more details on the tour, visit www.pearljam.com. Rat Sound can be found online at www.ratsound.com.